Pita Pizza: 6 Pita Bread Pizza Recipes: Make dinner super easy and fun with individual pita bread pizzas. 6 delicious varieties to choose from and to please EVERYONE! My family adores pizza. From taco pizza to florentine pizza to even pizza meatloaf, we love pizza. In fact, my daughter even requested a pizza theme for her 6th birthday. We had all the kids make individual pizzas and top as they desired. At the time I had made 15 balls of homemade pizza dough for each child to roll out to make their own personal pizza. Why I didn’t think to use pita bread as the base is beyond me, but I encourage you to try a pizza themed night or party with easy these easy individual pita bread pizzas. There is something about individual pizzas–right?! You can top mini pizzas however you like and not have to share with anyone. Or you can make a bunch of different varieties and sample a slice of each! All pita pizzas start with a pita bread, of course. However, you could use Naan bread, or even bagels or English muffins. I like to use whole wheat pita bread. Pita bread is the perfect thickness and size for an individual pizza. And because the base of the pizza is already complete, dinner can be ready in less than 20 minutes–YAY!!! What is better than classic tomato sauce smothered with cheese? 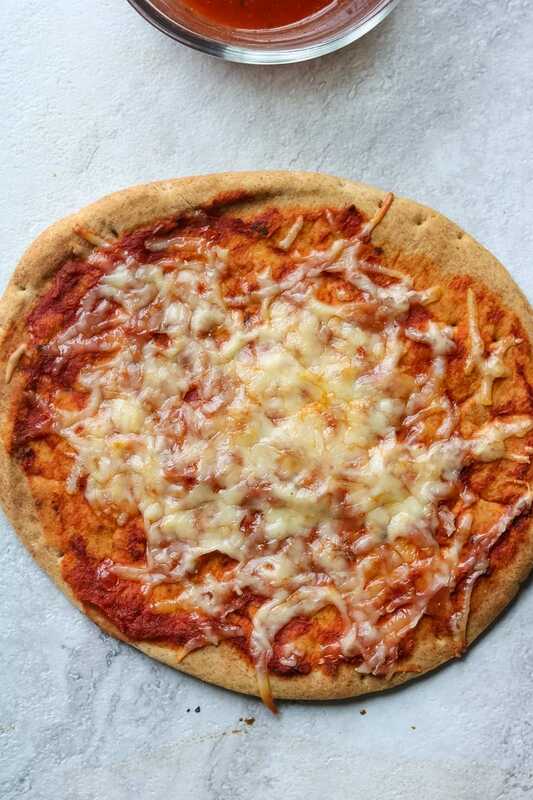 This cheese pita bread pizza is every kid’s favorite an incredibly easy to make! Feel free to add sliced pepperoni, as that is another classic pizza topping. I am a sucker for anything Buffalo Chicken! From Buffalo Chicken Tacos to Buffalo Chicken Bake, I could eat buffalo chicken every week. For this Buffalo Chicken Pita Pizza, I simply used up some leftover shredded chicken and tossed it with Red’s Hot sauce. 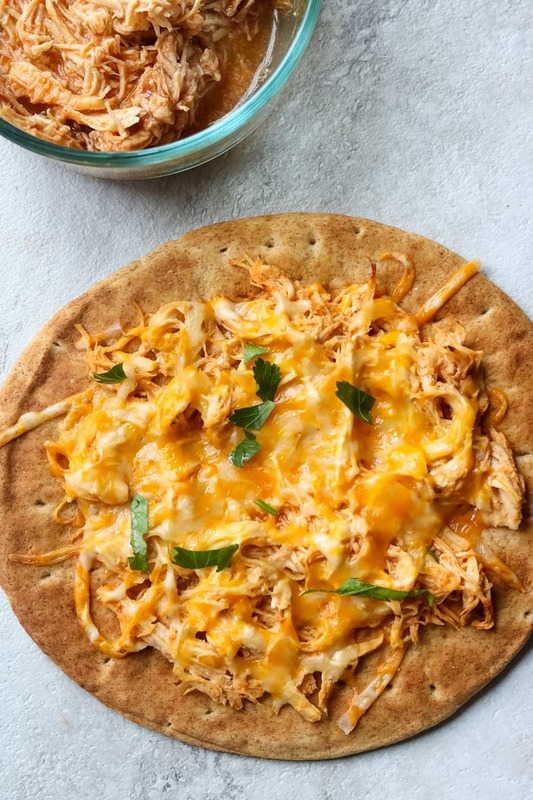 Once the chicken is layered over the pita bread, top with shredded colby or cheddar cheese and bake. Want to feed a crowd? Check out the recipe for a large Buffalo Chicken Pizza with Carrot and Cucumber Slaw. Strawberries and feta are MAGIC together. In salads and on savory pizzas. 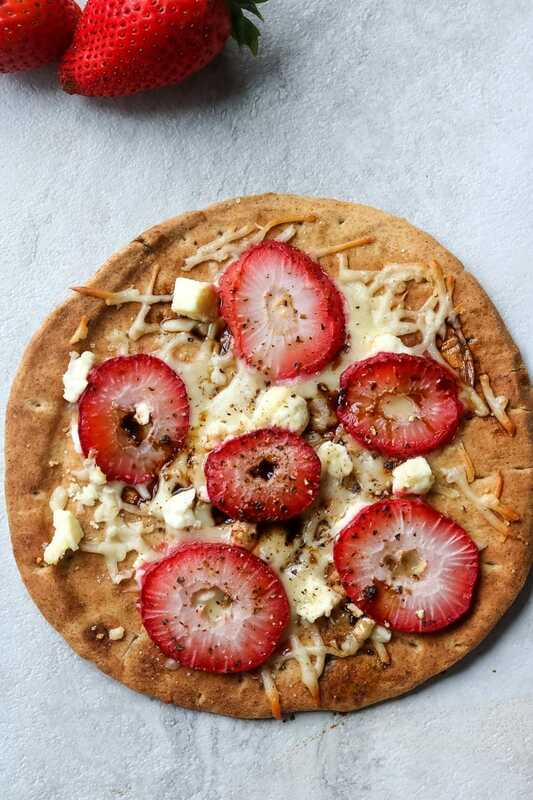 Top a pita bread with some mozzarella and feta cheese and sliced strawberries and a 4 ingredient pita pizza is anything but boring. You can really take it over the top with the addition of a drizzle of balsamic vinegar. Want to feed a crowd? Check out the recipe for a large Strawberry Arugula Pizza. BBQ chicken pizza is a cult favorite. What is not to love when tangy barbecue sauce is mixed with shredded chicken and then smothered in cheese? 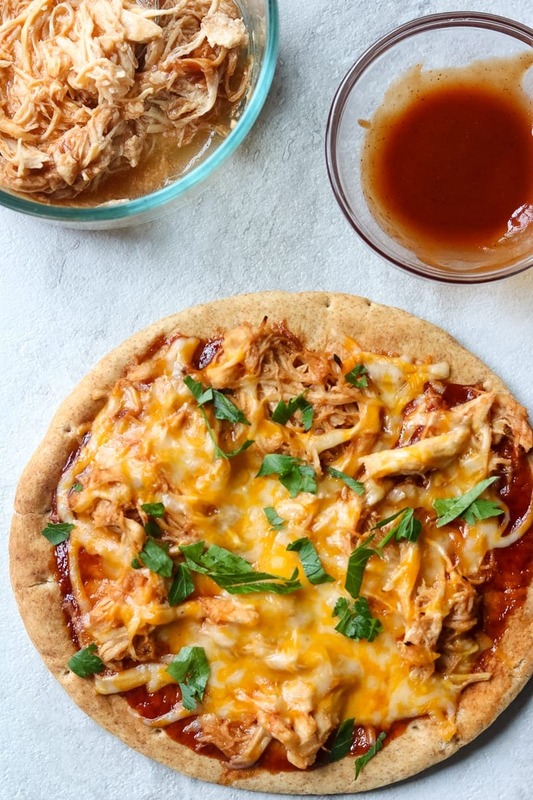 Whether you use leftover BBQ chicken or BBQ Pork, this mini BBQ pizza is irresistible. I suggest spreading a thin layer of your favorite barbecue sauce on the pita pizza and then top it with shredded chicken (or pork) that is tossed with a bit of BBQ sauce itself. Top with cheddar or colby or even mozzarella cheese and then bake. Top with cilantro if desired to brighten up the flavors. 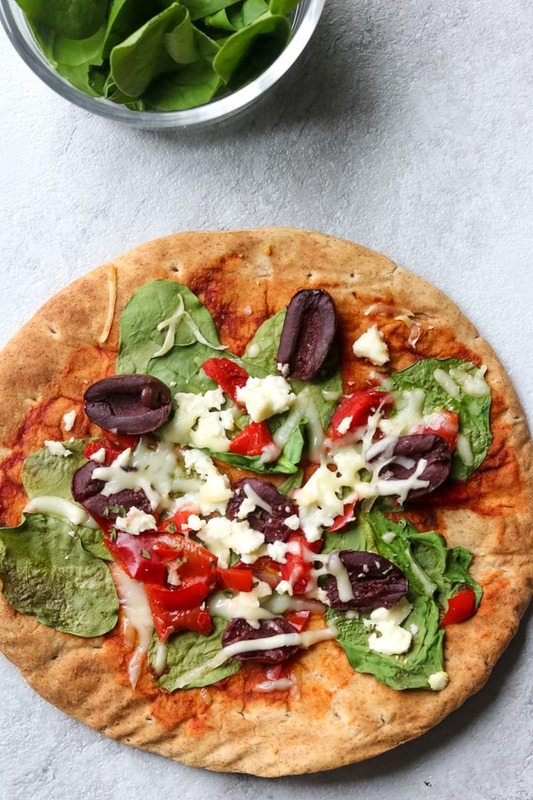 If I had to pick a favorite, this Greek Pita pizza would be it! I adore anything with Spinach and Kalamative olives. To make a Greek mini pizza, spread a thin layer of tomato sauce on a pita. Top with fresh spinach, roasted peppers, mozzarella and feta chees and sliced kalamative olives. Sprinkle with dried oregano and bake until cheese melts. This peanut butter marshmallow chocolate chip pizza comes to you from my kids. And it is GENIUS!! 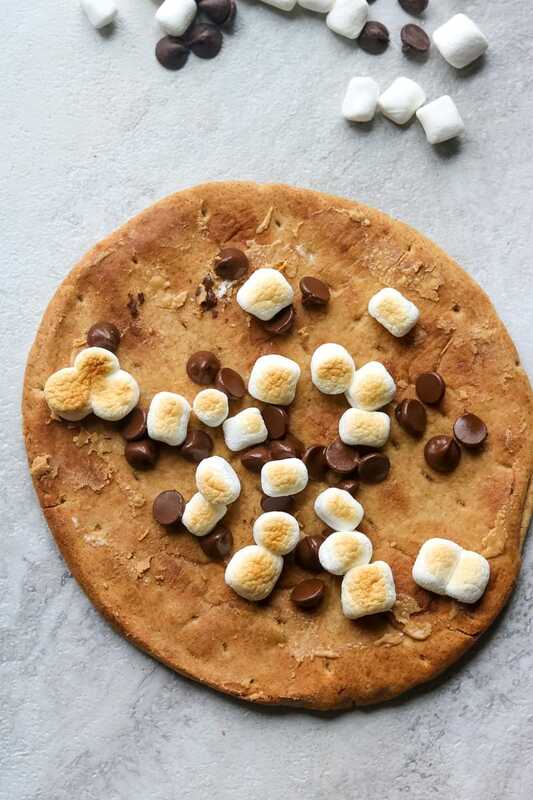 We spread the pita with a thin layer of creamy peanut butter (almond butter or sunflower butter would be great as well) and then topped with marshmallows and chocolate chips and baked in the oven until the marshmallows were toasted an the chocolate about melted. This sweet pizza is the perfect ending to pizza night! 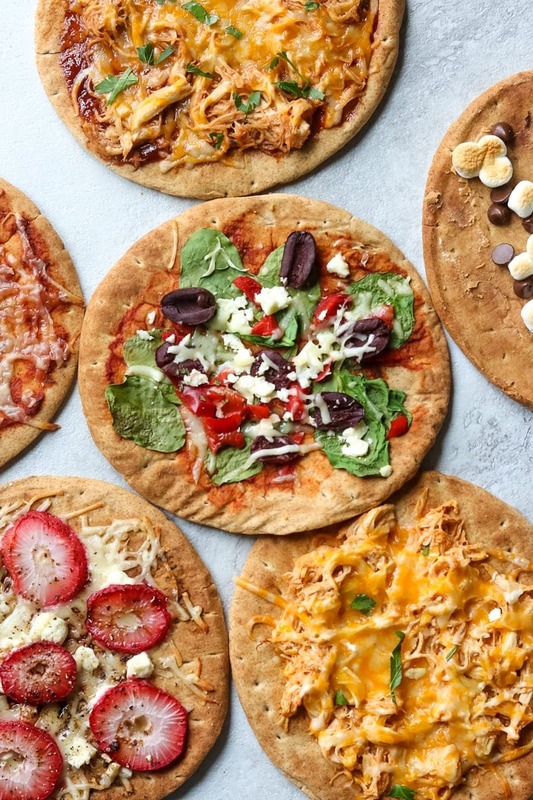 Obviously my recipes for different types of pita bread pizzas are just to serve as a starting point and you can use any toppings your family desires. Naan Bread or even sandwich thins can be substituted for pita bread to make individual pizzas. You could even use homemade or store bought pizza dough for these recipes, but they would would need to be baked longer. I prefer to use whole wheat pita bread for the added benefit of whole grains. Gluten free Naan Bread or pita bread can be used for gluten free individual pizzas. You can even use this recipe from Gluten Free on a Shoestring for homemade gluten free pita bread. This is a great recipe for a party. Just have toppings out for people to choose from and each person can make their own pizza. Bake up your guests creations, and everyone will have a pizza they are sure to love. Assemble each pizza with desired toppings. And bake for 10 minutes until cheese (or marshmallows are melted). Spread a thin layer of barbecue sauce on the pita pizza and then top it with shredded chicken (or pork) that is tossed with a bit of BBQ sauce itself. Top with cheese and then bake. Top with cilantro if desired. Toss chicken with hot sauce. and spread over pita. Top with cheddar cheese and bake until cheese is melted. Top a pita bread with the cheese and then sliced strawberries. Bake until cheese melted and then drizzle with balsamic vinegar. Spread pita with tomato sauce and then top with cheese. Bake until cheese melts. Spread pita with tomato sauce and then top with spinach, peppers, and olives. Top with both cheeses and dried oregano. Bake until cheese melts. Spread Peanut Butter over pita bread. Sprinkle marshmallows and chocolate evenly over peanut butter and bake until marshmallows are toasted and chocolate begins to melt. Nutrition is calculated based on plain cheese pita pizza. Such a fun way to make pizza! Saving this for our next pizza night! YAY! It is such an easy way to make the whole family happy!